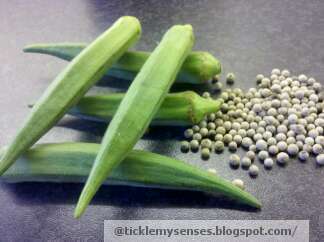 Lady Fingers/ Okra/ Bhendis is a very popular vegetable at home. If cooked properly with the right blend of spices these slimy green fingers can be turned into a delicious vegetable. I have used a combination of pepper and fried garlic to add flavour to this dish. It is truly worth trying. Served best with chappatis or curd rice. 1. Wash the bhendis in water and then lay flat for a few minutes on kitchen paper towels to dry completely or wipe dry. This step is very important to reduce sliminess of bhendi. 2. Next slice the dried bhendis on a dry chopping board using a sharp dry knife. First slit the bhendis length wise into halves then into halves again ( each bhendi into 4 long strips), and then horizontally across through the center. This should give you 8 bhendi pieces. Make sure knife remains slime free by wiping frequently on a kitchen towel. 3. Cube onions into 1/2 inch cubes. Slice garlic finely across width. 4. Place a large wok on medium-high heat, add 3 tbsps oil, add mustard seeds when hot, once they splutter add urad dal, and cumin seeds, when urad turns brown and cumin fragnant add sliced garlic and fry till garlic is aromatic and lightly browned. 5. Add slit green chillies, onions, turmeric and salt, stir fry till onions turn translucent. 6. Turn the heat to high and add the bhendis , stir fry continuosly. Add the remaining 3 tbsps oil at intervals pouring oil on the sides of the hot wok, rather than directly on the vegetable, sprinkle pepper powder, continue to stir fry bhendis for 5-7 mins or more till cooked and slightly crunchy. Taste for salt. Cooking on high heat allows the bhendis to cook faster, reduce sliminess and retain their crunchy texture. Bhendi losun-meri is ready, serve with soft chappatis or curd rice, pickle and papad. Note: Left overs make excellent vegeterian sandwiches. Just spread a layer of low-fat soft processed cheese on both bread slices, place a generous layer of bhendi on one slice. A little tomato pickle on the other slice. Close the sandwich and toast in a sandwich maker till the bread is crunchy and brown on the outside. For non- vegeterian sandwiches add slices of left over chicken breast on top of the bhendi. Then toast as above. I tried Bhendi Losun Miri Fry and it came out very well. Thank you for this recipe. 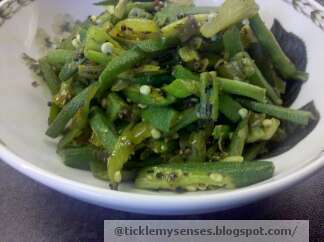 I came across your blog searching for a particular tendli recipe that my mum makes... havent been able to find it anywhere as yet..it could also be made with bhindi and this recipe seemed pretty close to it...am gonna check out other recipes you've posted n try them out too... :) .. Thanks for sharing them.